Is This MOSFET Logic Level, Or What?!? There's a lot of confusion, [and even among "the professionals", a lot of controversy] regarding the true definition of Logic Level. At 4A it's not. The Gate voltage (VGS) needs to be at least 10V, to guarantee operation at 4A. At 3A it's 5V Logic Level, but it's not guaranteed to work at 3.3V levels. At 2A, its good even down to 3.3V levels! And, in fact, even down to 2.5V levels!! So, it depends on what you intend to drive with it. Sometimes a MOSFET datasheet will clearly state that it's Logic Level device. But, if that language is absent, it can mean one of two things. The manufacture chose to leave that out. It's NOT a Logic Level device. In other words, it seems to be the case that the only clarity on the subject comes when a device is actually declared to be Logic Level [ie, the datasheet actually says so]. Otherwise, you can't really be sure, and are left to make your own determination. 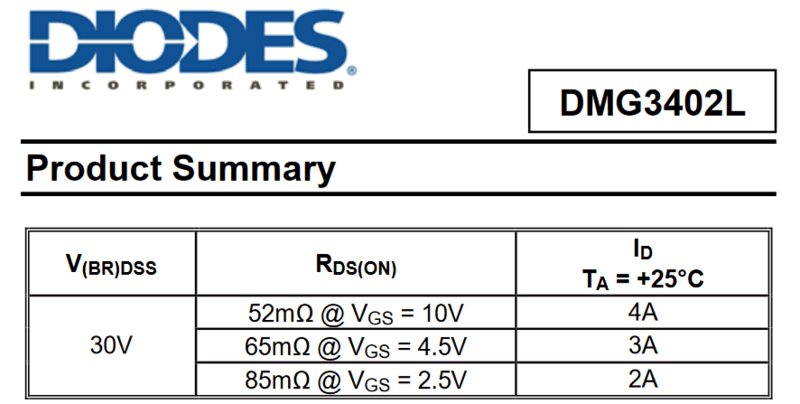 And, even when a datasheet commits to Logic Level functionality, that, typically, only refers to 5 volt logic. If you're looking for a MOSFET that will work in, for instance, a 3.3V environment, don't rely on the "Logic Level" claim! In other words, even though the datasheet says "Logic Level", it doesn't mean the MOSFET will work at voltages less than 5V [or actually 4.5V, since it's wise to allow for a 10% supply voltage deviation--though modern regulators tend to have output voltage tolerances of 2% or better]. The [Static] Drain-Source On[-State] Resistance [RDS(ON)] (usually included in the Specifications). The Drain-Source On-Voltage [VDS(ON)](usually included in the Specifications). One or more if the Typical Characteristics graphs. Typically, at the top of a datasheet, there will be a summary of the more interesting characteristics. For instance Figure 2, which is the Fairchild product Summary for their FDP8896. This is an example of a datashet that doesn't specify this as Logic Level, but notice how it lists the rDS(ON) at both a VGS(ON) of 10V and 4.5V. That 4.5V offering quite credibly bumps this MOSFET into the Logic Level zone. 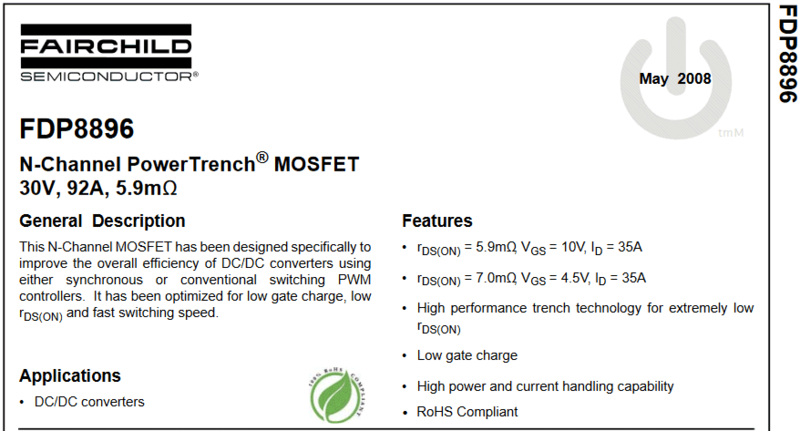 Figure 3 shows the Product Summary of the Vishay IRF540 MOSFET. Here's an example of the kind of Box Free thinking that leads to design versitility: Most would argue that an IRF540 [often found in those "Arduino Starter Kits"] is NOT Logic Level. But, even an IRF540 can be considered [5V] Logic Level, if the Drain current is limited to around 6A —. How can I tell? Have a look at Figure 4. 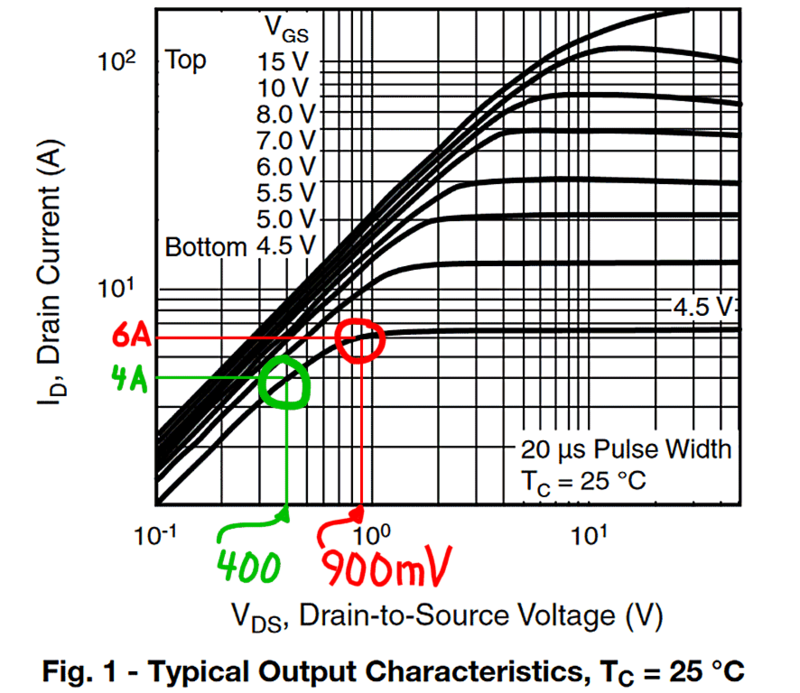 This graph shows typical ways this MOSFET behaves for different Gate Voltage levels [different levels of VGS]. Each black line, on the graph, represents a different VGS]. And across the span of the line are all the different ways the MOSFET will [typically] behave for different levels of voltage across the Drain-Source channel. Notice how the lines bend at a certain point. Moving from right to left, the line starts out horizontal [though, some of the VGS lines are a bit wonky — especially the ones above 5.5V]. Then, the line dives downward. That downward slope portion of the line is a region where the MOSFET behaves like a linear resistance. The horizontal [or relatively horizontal] portion is a region there the transistor behaves like a constant current regulator [or relatively constant]. When the MOSFET is operating in that linear resistance region, it is considered to be turned all the way on (also known as satureated). It's, basically, behaving like a switch that is closed. The linear resistance is akin to a mechanical switch's contact resistance. The point, on the 4.5V line, marked by a red circle, is the point where the IRF540 is just reaching saturation. At that point, there is [typically] nine tenths of a volt across the Drain-to-Soruce channel, when 6 amps are flowing through the channel. Thus, this MOSFET is functioning quite well at the Logic Level of 4.5V! At that point the transistor is dissipating around 5.4 Watts [6A x 900mV], so it will, probably, need a heatsink, but these parameters are well within what is considered proper operation, for this device. Also notice, though, that with 4.5V on the Gate, this transistor won't allow currents higher than 6A to flow through the channel -- so for currents higher than 6A, this is NOT a Logic Level MOSFET. So, perhaps, the concept of Logic Level requires a caveat -- Logic Level below a certain channel current. The Green circle indicates a point on the curve where the transistor can run at a mere 1.6 Watts. So, if you only run this transistor at 4A, you might not even need a heat sink. This transistor is designed to run at much higher currents than 4A, or even 6A, and one might be inclined to argue that the Logic Level designation only applies if the transistor can function closer to it's designed limits with a Logic Level stimulus, but even a so-called Logic Level transistor, isn't Logic Level above a certain level of current — a level only reachable with a higher than Logic Level voltage on the gate. So, where is this line to be drawn? So, is it silly to run an IRF540 at drain currents of 6A or less? Maybe. But, if that Arduino Starter Kit only supplied an IRF540 [which is often the case], you can still do fun stuff with it, as long as the fun doesn't require more than 6A. MacGyver would do it [see caveat, below]! I wouldn't use an IRF540 at 3.3V, though, because the lowest voltage on the datasheet's transfer curve graphs is 4.5V, and the worst case gate threshold voltage is 4V. Have a look at Figure 5. The Gate-Source Threshold Voltage [VGS[TH]] offers a MIN of 2.0V and a MAX or 4V. That means this transistor might turn on at 3.3V, but, there's a chance it won't, so not wise to use this in a design that relies on it functioning at 3.3V!! I don't see any problem with a hobbiest cherry picking an IRF540 with characteristics that will allow it to behave as a credible switch at 3.3V, but if a bonified engineer ever did that -- in a production design -- they should be locked in a faraday cage for the rest of their natural life! Now, I'm not one of those Bad A$$ engineers that design Switch Mode anything! Which is why the following insights, recently offered to me by one of those Bad A$$ engineers, was news to me. The output from typical logic devices, such as TTL, CMOS, MCU, etc, can't deliver enough current to properly PWM drive a MOSFET—at least not at the high speeds typically associated with efficient Switch Mode designs. That for switching speeds less than 100nS, a gate driver is an imperative for high speed PWM, as gate drive currents of 0.1A, to as high as 2A, are needed to overcome the [relatively] high input capacitance of a typical high power MOSFET gate. Not even an MCU output [such as on an Arduino] can muster up currents like that—expecially not at Logic Level voltages! And, generally, it's better to not use a Logic Level device for any kind of high speed switching because they're less robust in such an environment. Besides, a gate driver will supply voltages sufficient to drive a non-Logic Level device, so there's no need for Logic Level, in this context. So, Bottom Line: If you're using MOSFETs to do the kind of stuff I normally do, like lazily turning things ON and OFF, at near DC rates, or using MOSFETs to drive high-side MOSFETs that lazily turn things ON and OFF, then all the stuff I said, about busting out of that techno-snob box, is true. But, that IRF540 should never be considered Logic Level if you plan to use it in something like an efficient BOOST or BUCK switching design. In fact, don't even consider using an IRF540 for any of that esoteric stuff. There are far better, more modern MOSFETs on the market!